Not only is Norway home to some of the most incredible scenery in the world but it also maintains several scenic driving routes that allow tourists and locals to witness these wonders with their own eyes. Whether you are looking for a short scenic drive that won’t take more than a few minutes to complete or a longer route that extends over a distance of more than 100km, you can find it all in Norway! The roads are great and there’s no shortage of campgrounds throughout the country so drivers are encouraged to travel by campervan, RV, or motorhome rental from Oslo or Grimstad in order to save money on accommodation and provide them with extra comfort and convenience. Some of the shorter drives include the memorable coastal 9km Atlantic Road, the 40km long Jaeren National Tourist Route from Ogna to Bore, the 58km Andoya National Tourist Route and the 47km Aulandsfjellet National Tourist Route. The Hardangervidda National Tourist Route extends over a distance of 67km and allows drivers to enjoy a wide range of outdoor activities and the possibility of spotting some amazing wildlife. The 29km long Lysebotn Road is also a fairly short drive but does include several twists and turns which means that you will most certainly take your time and enjoy several breaks along the way. When travelling from Kokelv to Havoysund, take the Havoysund National Tourist Route and enjoy your 66km drive. 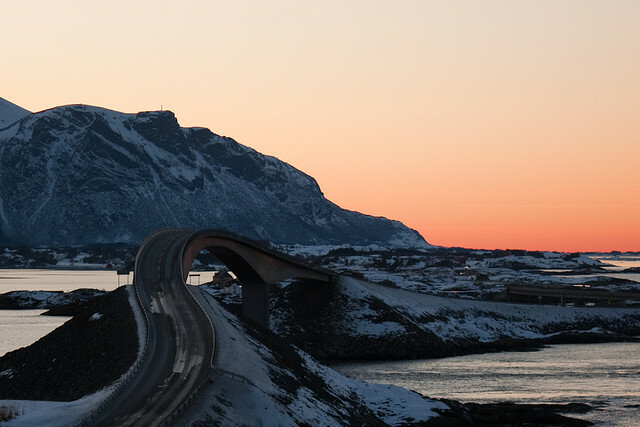 The The Old Strynefjell Mountain Road and Valdresflye National Tourist Route are 27 and 49km in length respectively which makes them both quite easy to complete in less than an hour. Of course, the shorter drives mean that you will have that much more time to stop, enjoy a picnic lunch and really take in the views. The Senja National Tourist Route extends over a distance of 90km and takes drivers through a number of quaint villages and fishing hamlets. When travelling from Muen to Folldal, there is no better way to get there than by taking a leisurely drive along the Rondane National Tourist Route. Over these 75km you will encounter some of the most scenic parts of the country. 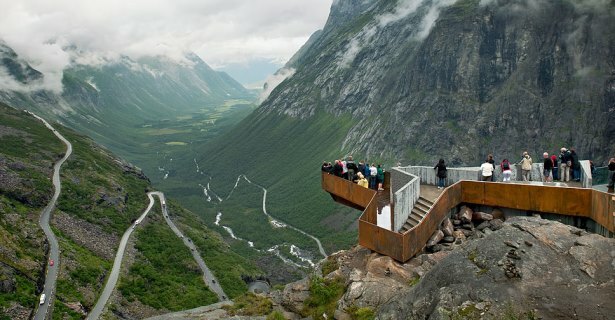 Some longer routes include the Gaularfjellet National Tourist Route, the Geiranger Trollstigen National Tourist Route, the Hardanger National Tourist Route, the Varanger National Tourist Route, Sognefjellet National Tourist Route and the Ryfylke National Tourist Route which all range from just over 100km to less than 200km in distance. If you are looking for a longer scenic drive to enjoy over several days, then you can try the 200km long Ryfylke National Tourist Route or perhaps the Lofoten National Tourist Route which extends over a distance of 230km. The Helgeland National Tourist Route is another long drive at 430km and is perfect for a long weekend or even a week long getaway. Some of these drives are open throughout the year while others experience road closures during snow season. Regardless of what time of year you visit, be sure to pack some warm clothes for the drive. You never know how the weather may change.